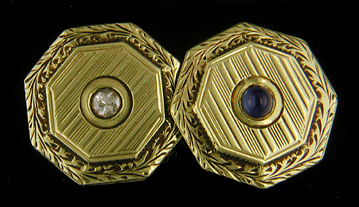 Charles Keller sapphire and diamond cufflinks, circa 1925. I hope everyone has enjoyed the best of the holidays and is looking forward to a happy New Year! The past several months, I have been pulled away from my first love, antique cufflinks. Several other jewelry-related projects have needed attention. I am looking forward in the new year to getting back to researching and writing about antique cuffflinks and adding new acquistions to the Antique Cufflink Gallery. I recently acquired a nice pair of Art Nouveau iris cufflinks and a wonderful Carrington dress set with etched mother-of-pearl centers. I will be adding these to the gallery in next the several weeks. Also, I am completing several new articles on the history and artistry of antique cufflinks that I will be posting in the next few months. Until then, I hope everyone is well and enjoys the best of 2013! Recent additions to the Antique Jewelry Gallery include an elegant Whiteside & Blank stickpin and a beautifully lifelike anemone brooch crafted in gold. Peridot and Garlands A shimmering green perdiot set amid flowing bellflowers and pendant drops. 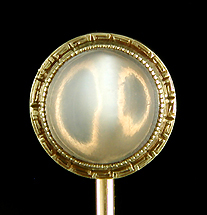 The elegant design of this stickpin recalls the Classical Revival styles of the Napoleonic and American Federal periods. Crafted in 14kt gold, circa 1910. Golden Anemone Beautifully crafted brooch of an anemone with richly detailed petals, stamens and center. In the late Victorian era jewels realistically depicting flowers were the fashion. Crafted in 14kt gold, circa 1900. 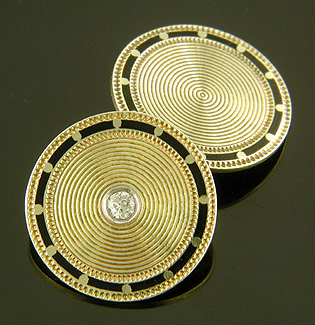 WAB gold and black cufflinks, circa 1925. During the the 1920s Wordley, Allsopp & Bliss (WAB) created a collection of yellow gold cufflinks with mesmerizing centers and dramatic black enamel borders. 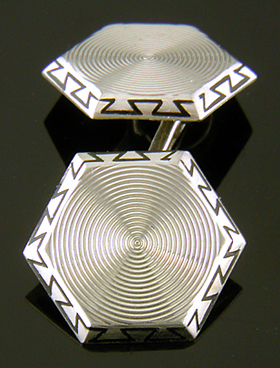 The design of the cufflinks reflected the Art Deco interest in abstract geometric patterns and striking visual affects. 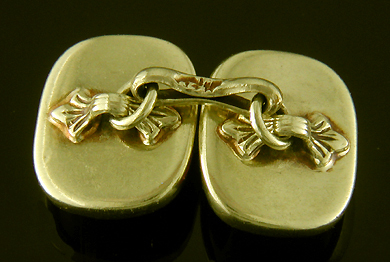 WAB richly detailed oval cufflinks, circa 1925. Often I discuss at length the cufflinks illustrated in this blog. But sometimes it is best to let the cufflinks speak for themselves. The beauty and elegance of these cuff jewels needs no explanation. WAB circle and diamond cufflinks, circa 1925. One of the pleasing aspects of this collection of cufflinks is their balanced design. The first two cufflinks illustrated at the beginning of this note are richly detailed, but the design is not overly cluttered. While the cufflink immediately above is somewhat plainer, the elegant simplicity of the design is beautifully accented with a sparkling diamond. Just the right balance of pizazz and simplicity for the cufflinks to be interesting without being over embellished. WAB bull's eye cufflinks, circa 1925. Wordley, Allsopp & Bliss created fine cufflinks from the early 1900s into the 1930s. They were prolific makers who catered to a wide variety of fashions and tastes. The elegant black and gold cufflinks pictured above date from the 1920s or possibly early 1930s. By the 1930s jewelry tastes were evolving. The warm tones of yellow gold were being displaced by the cool elegance of white gold and platinum. The angular, starker designs of Art Moderne came to predominate. A striking example by WAB is pictured below. WAB Art Moderne cufflinks, circa 1930. Recent additions to the Antique Cufflink and Antique Stickpin Galleries include an elegant Art Deco dress set by Carter, Gough and a golden menagerie of winged lions, basilisks and flying serpents all perched atop late Victorian stickpins. Art Deco Elegance The Art Deco era was a time of striking, elegant design. This dress set with pearl and mother-of-pearl centers and stylized bell-flower borders beautifully captures the spirit of the age. Crafted in 14kt gold, circa 1930. Winged Lion and Pearl The Victorians populated their stickpins with a teeming menagerie of flying lions, griffins, winged serpents and fiery dragons. This charming example features a winged lion emerging from elegant foliate scrolls. 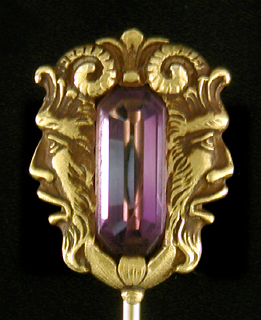 crafted in 14kt gold, circa 1900. Basilisk and Pearl A regal basilisk presents a luminous white pearl. A basilisk has the head and wings of an eagle and the body of a serpent - one of the fantastic creatures favored during the Victorian era. Beautifully crafted in 14kt gold, circa 1900. Winged Serpent A winged serpent warily grasping a small pearl. This little fellow has a lot of charm. The perfect miniature gargoyle to keep demons from your lapel. Beautifully crafted in 14kt gold, circa 1900. Dragon and Diamond A fierce dragon protectively cradles a small sparkling diamond. The Victorians loved to enliven their jewels with a teeming menagerie of dragons, griffins, basilisks and other fantastic beasts. Crafted in 14kt gold, circa 1900. With the summer temperatures moderating and the usual mid-summer lull in the gallery, I am taking a brief break. So, while I am off hiking in the mountains I will leave you with photos of one of the more interesting pairs of cuff buttons I have had the opportunity to work with this year. 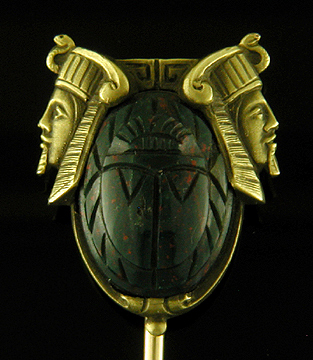 This wonderful pair of Victorian cuff buttons features beautifully carved hardstone (sardonyx) cameos. 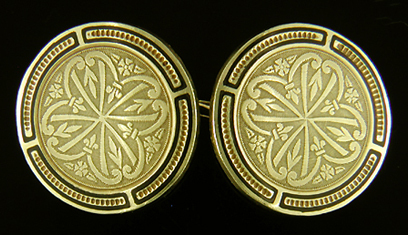 The cuff buttons were custom created for a gentleman in the decades around 1870. The portrait cameos likely represent the wearer's daughters or wife and daughter. Although, several clients have suggested more risque interpretations. 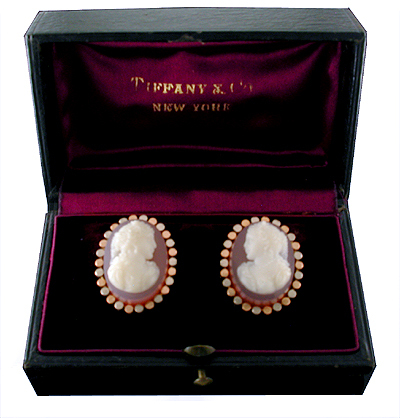 The cuff buttons were created by Tiffany & Company. They rest in their original fitted case with a regal reddish-purple silk and velvet interior. The silk lining beneath the lid is signed "Tiffany & Co./New York" in gold letters. For me these beautiful cuff buttons embody the three elements that define all fine antique cufflinks - beauty, history and craftsmanship. I hope everybody is enjoying a wonderful summer! I will be back next month to write about some mesmerizing cufflinks from Wordley, Allsopp & Bliss. Recent additions to the Antique Cufflink Gallery include an elegant Art Deco dress set in the all-white style of the 1930s and a hypnotic pair of Wordley, Allsopp & Bliss cufflinks. White on White A marriage of mother-of-pearl, pearls and platinum give the geometric design of this Art Deco dress set a striking elegance. Crafted in platinum and 14kt gold, circa 1930. 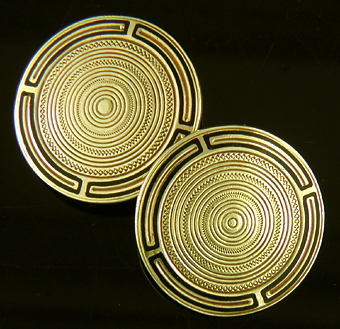 Hypnotic Circles Alternating zig-zag and pinstripe circles give these cufflinks a hypnotic bull's-eye affect. A nice example of the optically intriguing cufflinks of the Art Deco era. Crafted in 14kt gold, circa 1930. Recent additions to the Antique Stickpin Gallery include two wonderful stickpins created by Hans Brassler in the early 1900s. 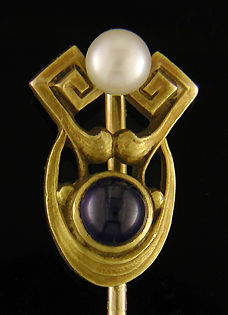 Sapphire and Pearl A rich blue sapphire and a luminous white pearl set in a free flowing Art Nouveau stickpin. A wonderful example of the imaginative designs of the early 1900s. Created by Hans Brassler in 14kt gold, circa 1910. Brassler Citrine An Art Nouveau stickpin created by Hans Brassler, a wonderfully imaginative jewelry designer of the early 1900s. The flowing Art Noveau design is set with a smoldering orange citirne and a small white pearl. Crafted in 14kt gold circa 1910. Charles Keller carnelian set cufflinks, circa 1925. In the jewelry trade there is an ugly expression, "semi-precious gemstone". The dismissive adjective "semi-precious" is used to denote gemstone varieties perceived to be of lesser value or prestige, much like the term "B list" denotes celebrities of lower calibre or lesser status. In the past any gemstone other than the traditional "Big 4" - diamonds, sapphires rubies and emeralds - could be mislabeled as semi-precious. While diamonds, rubies and sapphires glitter and sparkle, the so-called "semi-precious gems" offer virtues all their own. Not the least of which is a nearly limitless variety of beautiful hues and rich color patterns. These underappreciated gemstones found enthusiastic supporters among the cufflink makers and wearers of the late Victorian era and early 20th century. Here are a few colorful examples from the Antique Cufflink Gallery. Charles Keller sodalite cufflinks, circa 1925. Charles Keller & Company was a prolific maker of fine cufflinks from about 1890 to 1930. This pair of Keller cufflinks is set with dark blue sodalites accented with cloud-like wisps of white calcite. The gemstones bring to mind a night sky with a few wispy clouds illuminated by moonlight. Sodalite, along with lapis lazuli, was favored during the Art Deco period for its rich blue color. 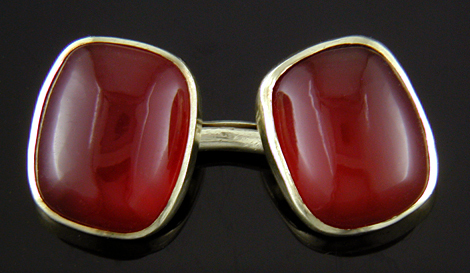 Charles Keller & Company also created the sultry red Carnelian cufflinks pictured at the top of this post. 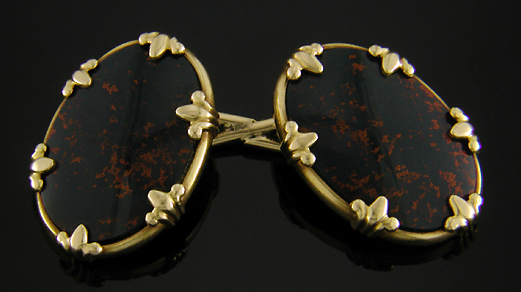 Victorian cufflinks set with bloodstones, circa 1900. If sodalite can be likened to a moonlit midnight sky, the fine bloodstones set in these late Victorian cufflinks are aptly described as glowing, hot embers flowing amid dark, cooling lava. Bloodstone is a captivating variety of the mineral quartz with a dark green, sometimes almost black, background and red flecks of iron oxide. 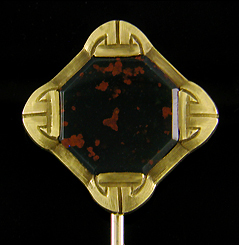 These beautiful bloodstones are set in oval gold frames and secured by fleur-de-lys prongs. Created by George O. Street & Sons in 14kt gold, circa 1900. 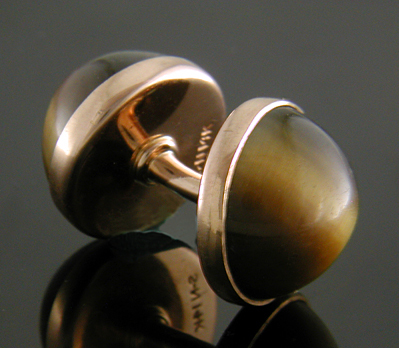 Sansbury & Nellis tiger eye cufflinks, circa 1925. Many decorative varieties of quartz were favored in gentlemen's jewelry. This pair of curved spool cufflinks by Sansbury & Nellis are set with dark brown and honey colored tiger eye's. The dramatic, rich tones of the gemstones are heightened by the rose gold setting. Tiger eye, like the bloodstones illustrated above, is a variety of quartz. A few more examples of quartz set cufflinks are illustrated below. 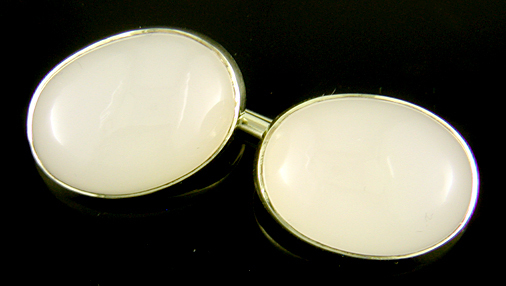 Art Deco white chalcedony cufflinks, circa 1925. 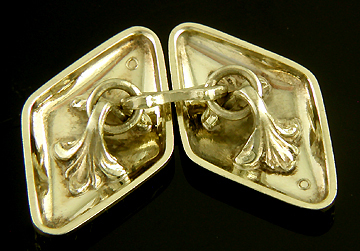 Sansbury & Nellis also created these dazzling white cufflinks from the Art Deco era. The gemstones are chalcedonies (pronounced "cal-said-knees"), a fine grained variety of quartz. Fine chalcedony appears to glow with an otherworldly light. The white chalcedonies set in these cufflinks have a billowy luminance reminiscent of a white fog bank just before it burns off in the morning sun. Sansbury & Nellis was one of the premier makers of fine gem-set cufflinks in the decades around 1920. 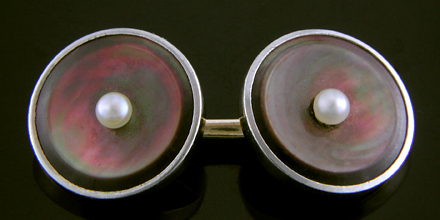 Carrington abalone and pearl cufflinks, circa 1925. Carrington cufflinks with carved abalone dishes set with glistening white pearls. Although abalone shell is technically not a gemstone, the iridescent beauty of this "semi-precious" material didn't escape cufflink makers and connoisseurs. In this pair the dark abalone creates a striking contrast with the platinum borders and center pearls. A beautiful example of the elegant, stark designs favored in the later Art Deco period. Once again confirming that Carrington & Company was the master of understated elegance. 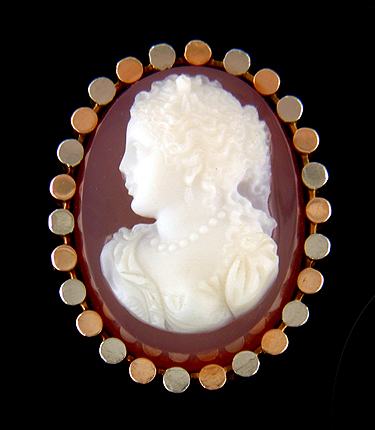 Tiffany sardonyx cameo cuff button, circa 1870. This pair of Victorian cuff buttons with cameo portraits (one shown) was created by Tiffany & Co. around 1875. 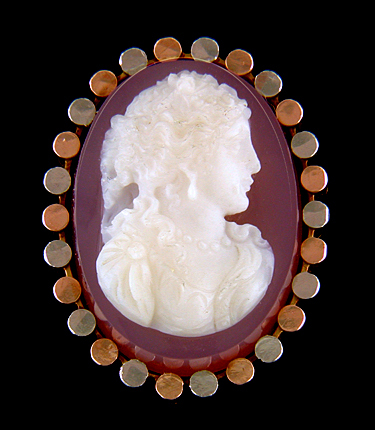 The cameos are carved in sardonyx, a lovely banded variety of quartz with alternating layers of dark red carnelian and white or colored onyx. The cameos are set in a border of alternating rose gold and platinum dots. These cuff buttons were likely custom created for a well-healed gentleman wishing to always have a portrait of his wife and/or daughters near at hand. Recent additions to the Antique Cufflink and Jewelry Galleries include a striking pair of George O. Street bloodstone cufflinks, elegantly engraved hexagonal platinum-on-gold cufflinks and a beautifully crafted horse brooch by Sloan & Company. Victorian Heliotrope Beautiful red-and-black bloodstones set in elegant cufflinks with oval gold frames and Fleur-de-lys prongs. 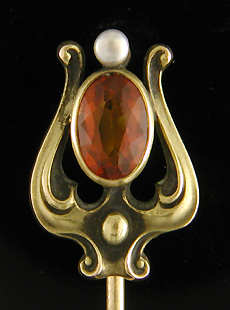 Created by George Street in 14kt gold, circa 1900. Elegantly Engraved Elegantly engraved platinum top cufflinks with foliate and quatrefoil designs and striking Art Deco borders. Crafted in platinum and 14kt gold, circa 1920. Whoa Nelly Equestrian themes were favored in the decades around 1900. 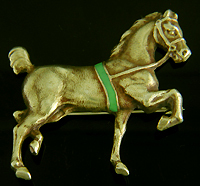 This beautifully sculpted horse brooch is richly detailed and accented with a green enamel girth strap. Created by Sloan & Co. in 14kt gold, circa 1900. While researching a unrelated topic in the Antique Cufflink Archive, I came across several additional examples of cufflinks created by the Fleur-de-lys Maker. 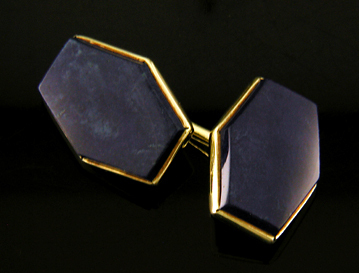 The cufflinks are elegant elongated octagons, essentially rectangles with deeply cut corners. While the shape doesn't have the same jagged edginess as the examples illustrated in last week's post, the cufflinks exhibit the same care in craftsmanship, design and fine detail. Hopefully more examples of the Fleur-de-lys Maker's work will emerge in the coming weeks. Cufflinks of the Fleur-de-lys Maker, circa 1925. Recently we have been discussing cufflinks created by an unknown maker nicknamed the "Fleur-de-lys Maker". The moniker refers to the distinctive brackets the jeweler used to anchor the cross bars on the reverse of the cufflinks. In this final post (at least for now) on the Fleur-de-lys Maker I would like to review some of the clues we have to the maker's identity. Although we have not identified the Fleur-de-lys Maker, these clues offer directions for further research. Here is what we currently know about this mysterious maker. 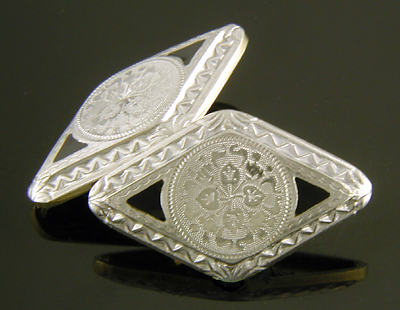 A small body of striking cufflinks is attributed to the Fleur-de-lys Maker. The cufflinks feature richly detailed centers and dramatic borders. They are crafted in platinum and 14kt gold and date from the decades around 1925. In addition to fleur-de-lys brackets, the cufflinks have distinctive outlines with jutting angles and unsmooth edges. The designs go against the prevailing fashion dicta that cufflinks should have rounded profiles, or at least softened corners, to ease their passage through a buttonhole. The cufflinks of the Fleur-de-lys Maker have a dramatic edginess. Brackets of the Fleur-de-lys Maker cufflinks. The flowing fleur-de-lys brackets have an Art Nouveau feel, while the decorative designs and borders date the cufflinks to the 1920s or early 1930s. A notable cufflink maker during this period was Charles Keller & Company, a prolific maker of fine cufflinks and other jewels from the 1880s to about 1930. The firm created a great variety of cufflinks employing a number of linkage and bracket designs. Among them were fleur-de-lys inspired brackets. This raises the possibility that Charles Keller is our mystery maker. But several factors urge caution. The Charles Keller fleur-de-lys brackets are stylized and flattened with more of an Art Deco, than an Art Nouveau, feel. Further, although Charles Keller created many beautiful cufflinks, I have yet to encounter an example of the firm's work which matches the exuberant design and careful craftsmanship of our mystery maker. Charles Keller & Company remains a possibility, but the link, if any, needs to be further explored. A second possible clue to the identity of the Fleur-de-lys Maker is found on the reverse of the marquise-shape cufflinks pictured at the top of this post. Just outside of the foot of one of the brackets is an indistinctly struck a "C" or "G" inside a diamond-shape cartouche. 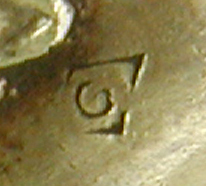 The mark is found on only one reverse and appears to be more accidental, than deliberate. The Providence-based jewelry manufacture S. B. Champlin Company employed a similar mark in the early 1900s. Established in 1872 by Stanton B. Champlin, the firm created cufflinks and other jewels until 1931. But any connection between our mystery maker and S.B. Champlin is for now at best tenuous. The mark appears on only one cufflink, is indistinct (it may be a "G" instead of "C"), and may have been inadvertent. Other signed examples of the maker's work will need to be found before drawing any conclusions. Fleur-de-lys Maker cufflinks with black enamel accents, circa 1925. To recap, we have several directions for future possible research, but still no answer to the question "Who was the Fleur-de-lys Maker?" I would love to hear from any readers who have similar cufflinks or possible knowledge of the maker. I will be happy to post any new clues that are uncovered and eventually we will solve this riddle. While recovering from recent back surgery I have been slower than usual in adding new pieces to the Antique Cufflink and Estate Jewelry Galleries. One piece I have had the pleasure of working with is a wonderful Victorian brooch of Flora, the Goddess of Flowers and Spring. An especially apt jewel for this time of year and, of course Mother's Day. I will be adding more jewels in the next several weeks. 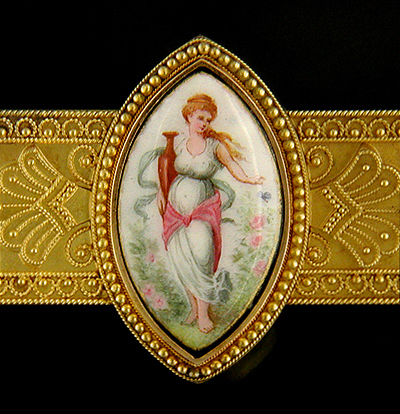 Goddess of Spring A wonderful hand-painted plaque of Flora bestrewing the early Spring landscape with flowers is set in a radiant gold Victorian brooch in the Classical Revival style. Crafted in 18kt gold, circa 1870.